One of the most important things you need to know about pregnancy and healthy eating is that you should be eating healthy even before you get pregnant. This is because by the time you know you are expecting, your baby may have been forming for several months and has needed all those essential nutrients that come from a healthy diet. The other aspect of pregnancy and healthy eating that you need to know about is that your own health will be affected by how you eat while carrying and nursing your baby. For example, if you don’t get enough calcium to support the baby’s growth, your body will give up calcium from your bones to supply what is needed. It is important that both you and your baby have a healthy outcome and, unless you are living in poverty, this is not difficult to achieve. Never will your diet be more important than during pregnancy. Allow yourself to gain some weight, to insure that your baby is getting all it needs and also has a comfortable place to rest. However, don’t use pregnancy as a license to overeat, especially junk food, which will not help you or your baby. It is safe to say that there is no other time in your life when your nutrient needs are higher than when you are pregnant or nursing. 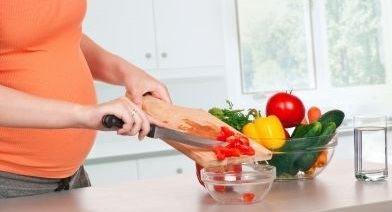 The food choices you make at this important time will have a lasting effect on the healthy of both you and your baby. I hope you will take pregnancy and healthy eating seriously along with our congratulations and best wishes for a healthy mom and baby! While all nutrients are important for a healthy pregnancy, there are some that are of greater concern. Vitamins and Minerals are a focus of pregnancy and healthy eating. Most pregnant woman will be advised by their doctor to take a prenatal vitamin/mineral supplement during pregnancy. This is because it is difficult to get enough of these nutrients, particularly iron, from the foods you eat, and pregnancy is not a time to leave it up to chance. While all of the vitamins and minerals are necessary for your baby’s proper growth and development, as well as your good health, here is a list of vitamins and minerals that are of particular concern during pregnancy. Folate has also been found to be important in preventing birth defects, such as spina bifida and anencephaly, so it is vital that pregnant women and women who are planning to get pregnant get enough folate. Caveat for Pregnancy and Healthy Eating: Since birth defects occur early in the development of the baby, and may occur before a woman even knows she is pregnant, getting enough folate is important for all women for whom pregnancy is a possibility. It is recommended that pregnant women get 600 micrograms of folic acid each day. Even if your prenatal vitamins supply this amount, it is a good idea to include folate rich foods in your diet to be sure you are absorbing enough folate for your baby’s needs. Note that the recommendation for daily intake of folate is given in micrograms (µg). A microgram is .0001 milligrams (mg), so even though it is a larger amount than recommended for non-pregnant women, it is still a very small amount. Leafy green vegetables… Liver… Fortified grain products… Legumes… Seeds… Citrus fruits. Keep in mind that folate is destroyed by heat and oxygen so be sure to use fresh foods promptly and lightly cook these foods to help preserve the vitamin content. Vitamin B12 is also a concern with pregnancy and healthy eating. Due to its close connection to folate, and its role in preventing birth defects, it is recommended that pregnant women and women who are planning to get pregnant make sure they get enough Vitamin B12. Since these defects can occur early in the development of the baby, and may occur before a woman even knows she is pregnant, getting enough of both of these B vitamins is important for all women for whom pregnancy is a possibility. Eggs… Meat… Dairy Products… Fortified cereal products… Red Skins of Spanish Peanuts. Since Vitamin B12 is found almost exclusively in animal products, vegans (those who exclude all animal products) should take a Vitamin B Supplement or be sure to include foods that are fortified with Vitamin B12. Interesting Fact about Pregnancy and Healthy Eating: Vitamin B12 is destroyed by microwave heating, so you may want to cook animal foods and fortified cereals using other methods. Note: Not all sources of Vitamin B12 are created equal. There are some plant-based foods on the market whose labels suggest that they are a good source of Vitamin B12. However, the form the vitamin takes may not be a form that is available to your body. If you take an oral supplement of this vitamin, you should know that of the amount listed on the label, only a portion will actually be absorbed by your body. It is recommended that pregnant women get 2.6 micrograms of Vitamin B12 each day. The recommendation for daily intake of Vitamin B12 is given in micrograms (µg). A microgram is .0001 milligrams (mg), so it is a very small amount. Calcium is vital to pregnancy and healthy eating. Although, calcium is usually talked about in relation to the development of osteoporosis later in life, it is also important at the very beginning of life, as the baby is growing and developing in the womb. During the third trimester, when your baby is growing at a faster rate and the bones are calcifying, there is a greater need for calcium. As mentioned before, if you don’t supply it with your diet, your body will remove it from your own bones for the sake of your baby, and as a result, your health will suffer. Although calcium has many functions in the body, its role in bone development is the one that is emphasized during pregnancy. In addition to providing a rigid structure for your muscles and tendons to attach to, the bones are also depositories for calcium, so that it is readily available to maintain your blood levels. Although calcium is also stored in your teeth, it is less available than from your bones. Calcium is found most abundantly in dairy products. Milk… Yogurt… Cheese… Ice cream. It is also found in some non-dairy sources. Broccoli… Cauliflower… Kale… Parsley… Bok Choy… Tofu… Sardines and other fish eaten with their bones… Oysters… Almonds… Sesame seeds… White beans… Pinto beans… Sweet potatoes… Whole wheat bread. Fortified products can help with pregnancy and healthy eating. Some products, such as orange juice, some fruit drinks, and some cereals, are fortified with calcium. It is important to note that the type of calcium used in fortification will affect its availability for absorption in your body. This means that it is possible that not all of the calcium listed on the label of the fortified food, will actually be accessible to your body. It is recommended that you get 1,000-1,300 mg of calcium each day while you are pregnant. Note-In addition to calcium, you will also need to get enough phosphorus (700 mg daily), magnesium (350-400 mg daily), fluoride (3 mg daily) and Vitamin D (15 micrograms or 600 IU daily), for optimum bone health for you and your baby. Iron is an important part of pregnancy and healthy eating. There are a number of reasons why you need more iron during pregnancy. -Your blood volume increases to accommodate the needs of your baby. -The baby is storing iron to help it through its first months of life. -There will be some blood loss during birth. Of course, these increased needs are somewhat offset, since menstruation does not happen during pregnancy. In addition, your body will adapt to pregnancy by increasing its ability to absorb the iron available in your diet. However, you will still need extra iron during your pregnancy. Since most women enter pregnancy in poor iron status, it is generally recommended that they take an iron supplement, particularly during the last two trimesters. In pregnancy and healthy eating, Baby comes first! If you don’t get enough iron while you are pregnant, your health will suffer, because your body will take the iron it needs for your baby and you will be the one left with a deficiency. In order to be ready for birth and new motherhood, you need to make sure that you are as healthy as you can be and not deficient in any nutrients. Caveat for Pregnancy and Healthy Eating: Iron supplementation can cause constipation, so be sure to eat at least 30-35 grams of fiber found in vegetables, fruits, whole grains, legumes, nuts and seeds, every day and to drink plenty of fluids to avoid this problem. Although supplements can be helpful in achieving a good iron status, it is always preferable to get your nutrients from real food, whenever possible, and iron is no exception. Red meat is the most obvious food source of iron. However, other meats, such as liver and shellfish are also significant sources, as are fish and poultry. Egg yolks are also a great source of iron. Soy... Dried fruits... Legumes... Nuts and seeds... Potatoes in the skin... Peas... Tomato juice... Broccoli... Mushrooms... Cereals… Blackstrap molasses. A number of foods such as breads and cereals are often fortified with iron. Check the labels of the foods you buy to discover their iron content. Caveat for Pregnancy and Healthy Eating: Children are at risk from iron-containing supplements, and not just from ingesting the whole bottle. If you have other children, keep all supplements in a place where they cannot possibly be accessible to kids. Even a few iron pills taken by a child can have devastating results. This is one of the most common causes of accidental poisoning of children. Pregnancy and healthy eating includes getting enough zinc in your diet. Zinc is part of so many functions in the body that it is difficult to name them all, and those are just the ones we know about. Although it is a trace element, meaning you don’t need a large amount, zinc is involved in major processes throughout your body. One of the functions that needs zinc, is cell development because of its role in protein synthesis, and it is therefore a vital nutrient for the proper growth and development of your baby during pregnancy. Although your prenatal vitamins probably include some zinc, you can also get it from food sources. As with iron, during pregnancy your body seems to have an enhanced ability to absorb zinc. Meat… Seafood… Yogurt… Cheese… Eggs… Sunflower seeds… Pinto beans… Cashews… Almonds… Peanut butter… Garbanzo beans… Whole grains. It is recommended that you get 11-12 mg of zinc from your diet each day during your pregnancy. As you probably know, protein is the fundamental building material for our skin, bones, muscles and other tissues in the body. Whenever there is damage to any of our tissues, either due to injury or just normal wear and tear, protein is essential to rebuild that tissue. Protein is also required to build brand new tissue, which makes it crucial for children and pregnant women. In addition, protein is a key component of enzymes, antibodies and hormones. These are chemicals that play a major role in many activities in the body that, among other things, digest your food, combat disease and allow you to enjoy a healthy love life. Proteins also function as regulators of fluid balance and acid-base balance, which help keep you from swelling up, drying up, and/or becoming toxic, any of which could be life-threatening. Protein is also involved in the clotting of blood, which stops the bleeding when you cut yourself. Proteins act as transporters in the body, carrying important nutrients. These nutrients can get on the protein “bus” and travel to all the places in the body where they are needed. For example, hemoglobin, a protein in the blood, carries the oxygen from your lungs to your cells. Note: Your doctor will check your hemoglobin level during your first prenatal visit to make sure that it is at a level that is supportive of a healthy pregnancy. Finally, protein can be used by your body for energy. Needless to say, this is not the best use of protein, since it has so many uniquely important functions, as listed above, but without another source, your body may convert protein to energy. Pregnancy and healthy eating means an increased need for protein. During pregnancy it is recommended that you increase you protein intake by about 25 grams per day. A rule of thumb is that adults need about 7 grams of protein for every 20 pounds of body weight. For a pregnant woman, add about 25 grams to this number. For instance, a woman who weighs 120 pound before pregnancy would need about 42 grams of protein (120 ÷ 20 = 6 and 6 x 7 = 42). While she is pregnant, she would add about 25 grams to this number to get 67 grams of protein per day. If you don’t want to do the math, just remember to include protein foods such as lean meats, dairy products, legumes, nuts, seeds, and whole grains with each meal, and you will most likely get enough protein. When we talk about protein in our diets, we are mostly talking about meat, eggs and dairy products. Another way of saying this is that most of the protein in our meals generally comes from the main course. Steak… Hamburger… Roast Beef… Pork chops… Ham… Bacon… Sausage… Hot dogs… Lamb chops… Chicken… Turkey… Duck… Capon… Fish… Shrimp… Lobster… Crab… Scallops… Venison… Omelets… Egg Salad. Caveat for Pregnancy and Healthy Eating: Due to their high methyl mercury content, you may want to limit white (albacore) tuna to 6 ounces per week and do not eat the following four types of fish: tile fish, shark, swordfish, and king mackerel. 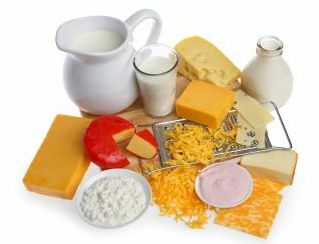 Dairy products, such as milk, cheese and yogurt are also good sources of healthy eating protein. Additionally, there are some plant foods that are significant sources of protein. These are the legumes, grains, some vegetables, nuts and seeds. Lentils… Split peas… Kidney beans… Pinto beans… Black beans… Soybeans… Garbanzo beans… Navy beans… Peanuts… Peanut Butter… Rice… Wheat…. Barley… Oats… Peas… Kale… Okra… Walnuts… Brazil Nuts… Almonds… Pumpkin Seeds… Sesame Seeds. 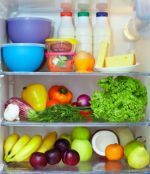 Most of the foods you eat have some protein in them, but those foods listed above, are significant sources that will make it simpler for you to fulfill your daily protein requirements. In addition, most healthy eating experts recommend that, whenever possible, choose a leaner or low-fat version of the significant protein sources. Caveat for pregnancy and healthy eating: It is not recommended that you use high protein supplements during pregnancy because these may be harmful to your baby. Carbohydrates have gotten a bad reputation in recent years, but, without them, you will not feel well and your baby’s health may suffer. It is important for you to know that you need carbs to be healthy before, during and after pregnancy. You and your baby need them for energy, and carbohydrate foods also contain many of the other nutrients, such as vitamins, minerals and fiber that your body needs. It has been estimated that a baby in the womb needs 135-175 grams of carbohydrate a day for brain development. In addition, if a pregnant mom does not get enough carbohydrates in her diet, her body will break down protein for energy, which may deny the baby the protein it needs for all the reasons listed above. Important note for Pregnancy and Healthy Eating: You also need carbs in the form of fiber to keep your system running smoothly and to maintain the healthy and tone of your digestive system. It is recommended that you get at least 30-35 grams of fiber daily throughout your pregnancy, in the form of fruits, vegetables, whole grains, legumes, nuts and seeds. Carbohydrate foods are the plant foods that you eat. French fries… Doughnuts… Chips… Pies… Cakes… Cookies… Products made exclusively from white flour. It is important that you choose most of your foods from the first list rather than from the second. In addition to being poor carbohydrate foods, the foods in the second list are generally low in fiber and loaded with added sugars, fats, particularly saturated fats and trans-fats, which are not good for you or your baby. How much carbohydrate is needed for pregnancy and healthy eating? Keep in mind that about 40% of your calories should come from healthy carbohydrate foods. This means if you are eating a 2,000 calories diet, about 800 of the calories should come from carb sources. You can achieve this goal by including two to three healthy carb foods with each of three meals each day and one to two servings with two snacks each day. Focus on including a variety of vegetables, fruits and whole grains and don’t forget legumes, which have a healthy combination of carbs and protein. Fat provides flavor and satiety in your diet. Without it, many foods would lose their savor and you would find yourself hungry all of the time. One of the advantages of eating a meal or snack with some fat in it is that it takes more time to get through your digestive system, which means you feel satisfied longer and may avoid the nausea that often accompanies an empty stomach when you are pregnant. Aside from these gustatory advantages, fats, along with protein and carbs provide energy, both at the time the fats are eaten and later, when released from storage in your body. This energy is important since, your basal metabolic rate will go up during pregnancy, meaning you will need more energy for basic body processes than before. In spite of the taboos placed on fats since the low-fat diet craze, without them your baby will not develop properly, particularly since the baby’s brain is largely made up of fats. However, you should be aware of the type and quantity of fats you are eating. There has been a lot of press about the importance of the essential fatty acids, Omega-3 and Omega-6. These are called “essential” because your body cannot produce them on its own, so they must be supplied by your diet. It has been suggested that many people, while getting enough Omega-6, are deficient in Omega-3. Keep in mind that both of these types of essential fatty acids are vitally important to the development of your baby and for your good health during pregnancy. The main sources of Omega-6 are meats and vegetable oils, while Omega-3 fats are found in nuts, seeds and cold-water fish. If you are a vegetarian, a good source of Omega-3, is freshly ground flax seed or chia seed. How much fat is needed for pregnancy and healthy eating? It is generally recommended that you get 20-30% of your calories from healthy fats with not more than 10% from saturated sources. Include some of the Omega-3 foods listed above to be sure you are getting enough of the essential fatty acids that you and your baby need. It is generally not a problem to get enough Omega-6 fats, since they are present in so many common foods. Food choices during pregnancy will vary greatly depending on taste, budget and availability of foods. Ideally you should choose a variety of whole foods from all of the food groups, including colorful fruits and vegetables, whole grains, lean proteins, low-fat dairy and healthy fats. You should limit overly processed foods, fast food and empty calories, including soft drinks, sweets and salty snacks. When planning your meals, choose a serving from several different food groups for each meal and snack. In this way, you are more likely to cover all your bases and get the nutrients you need for a healthy pregnancy. Click here for a printable list of Healthy Eating Guidelines. I hope this page had encouraged you to learn about pregnancy and healthy eating. Please click on links at the top of the page for more information about specific topics. Click here to go from Pregnancy and Healthy Eating page to Navy Bean Soup Recipe page.